I am happy to report that the great rose crisis of the past two years is over. After heaping them this winter with compost and carefully cutting them back this spring and watering them and fertilizing them-we have had our first beautiful bloom open up! It was glorious. We are now anxiously awaiting the others to share their joy-just to make sure they are okay. It is the pink rose below. My 'falling in love' rose is almost ready to open as well. I will share pictures of it when it opens. I was very careful in my rose selection for number of petals as well as the color. I wanted one of each striking rose color. The only color selection I do not have is a white-I couldn't resist the 'falling in love', so this was chosen in lieu of a white rose. Today we planted our pink petunias along the driveway. We have a small strip towards the bottom of the driveway between the driveway and the rock garden that is reserved for annuals. This year we did pink petunias. My husband and youngest son, Nathan, assisted with this project. 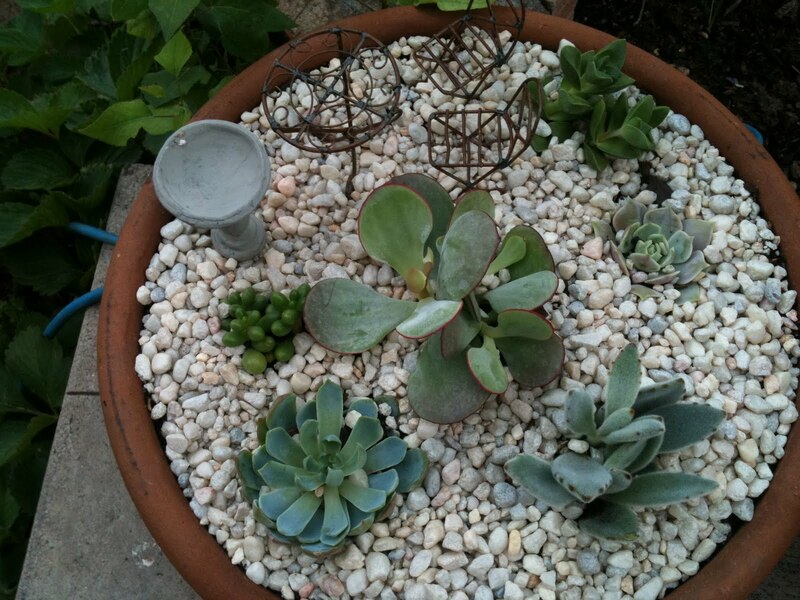 My final project was to plant my succulent dish garden. This was fun and rewarding. I love it! Now they just need to grow a little and fill in nice and thick. These are relatively easy to put together. Surprisingly Lowe's and Home Depot have a great variety right now of small size succulents to chose from. Buying the groundcover pearl pea gravel and the cactus/succulent soil was only around $30.00. I already had a pot that I bought many years ago in Santa Fe at Jackalope. I added my finishing touches of a miniature bird bath and a miniature bistro patio set-courtesy of my sister and nieces for my birthday. I just love it! So far, I think this is the best year for my garden. I have been slowly adding some shade perennials to the shade garden here and there trying to get it to the colors I want. It is not complete, but always a work in progress. That is all for my updates for now! Miniature trees will arrive in a week or so and I will update again at that point. good luck to you with your roses. I understand how you feel. I'm a novice when it come sroses..in-fact I'm a novice gardener period, but my lack of knowledge has not prevented me from trying. So far I have two roses that have not died on me yet. One passed along to me from my grandfather and the other came with my house. Come by and check them out when you have the opportunity. Your little rose looks lovely... Good for you. Your Roses look great. Like your blog and what you have going on this year. I am your new follower. Would appreciate your stopping by and following. Have a nice day. Your garden in the header is stunning! Good luck with your roses, and welcome to Blotanical! Good luck with the roses. I planted only Knockout roses and they need no care except pruning, since I like to keep them on the small side. I shouldn't have bothered. after leaving them alone of the past 10 years, the deer decided to "prune" off all of my flowers! I only grow perennials in my beds.